The hearts of beer lovers start beating a bit faster as October approaches in anticipation of the new bock beer season. Also mine skipped a beat when I arrived at the annual Bockbierfestival in Utrecht (NL) last Saturday. A rendezvous with many of my dear Dutch friends also played a part in this of course! This is just one of the many bock beer festivals in the Netherlands and other European countries that are held in celebration of these mighty fine beers. Beer of the God of Thunder? There are many theories about the origins of the name Bockbier. One of them is that it evolved from ‘Einbecker Bier’ (the city of Einbeck in Germany was famous for its beers in the Middle Ages) into ‘Bockbier’. Another theory is related to the Germanic god Donar (i.e. the Norse god Thor) and his goat-led chariot. Donar was the symbol of fertility and ensured a good harvest. The dark beers, brewed from the harvested grains, were named after Donar and his pack of goats. Bock is the German word for goat. 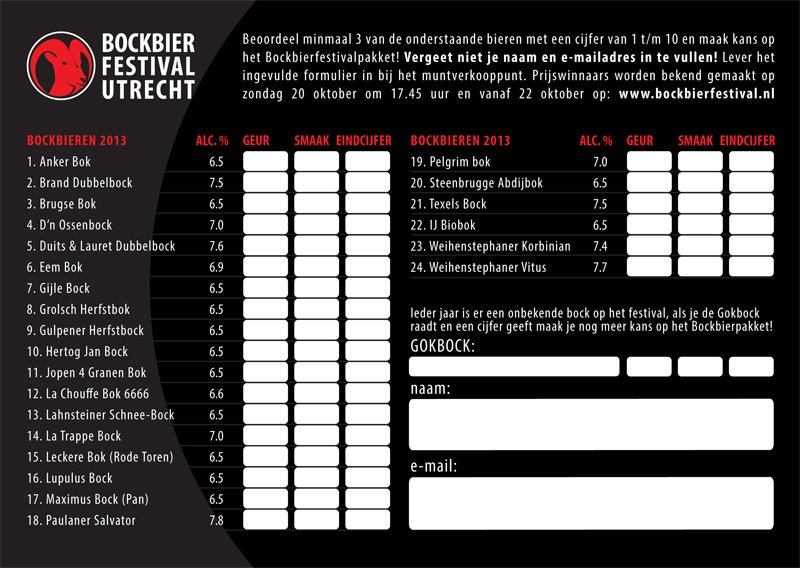 This year the festival in Utrecht had 24 different bock beers on the menu. Click here to view the entire menu. I decided to take it easy this year (due to social commitments the following day) and only bought 4 tokens for the entire day. Of course I also had to buy the special festival glass as a souvenir! I chose the German Weihenstephaner Korbinian because it made me think of some kind of alien race from Star Trek. Other criteria I take into account are the alcohol percentage and the brewery. Beers shouldn’t be sweet and not too bitter! Also, if it’s easy to buy at the supermarket, then I tend not to try it at the festival. The top two are both winners! However, I also recommend these from experience: La Trappe Bock, La Chouffe Bock 6666 and Hertog Jan Bock. Bock beers are sold from October till March. Funny enough one of the beers on the menu, Texels Bock (from the Dutch island of Texel) is sold all year round at a pub just 2 minutes from me in London. I’ve been told that this is the only pub in London that has permission to sell this beer. Coincidence? As my first blog entry was on street art, my dear followers might have expected a more cultural follow-up. That is why I also took photos of Utrecht, a beautiful student city with a rich history. Many harvests ago I spent five years there as a student. Utrecht is especially well-known for the many restaurants in the wharfs and cellars that are accessible on water level, and also of course for the Dom Tower, the tallest church tower in the Netherlands. But also the first UFO landed here. Forget about the mystery in Roswell! Come to Utrecht to discover UFOs. This UFO was placed on top of a building right next to the train station in 2000 for the arts festival Utrecht Panorama 2000. I remember this very well as I was a student there at the time and enormous art objects suddenly took over the city. Sadly, the UFO is the only remaining object. And last Saturday I suddenly discovered this giant tea pot. Probably those aliens are as tall as the Dom Tower now! Want to try a Bockbier? The Bockbierfestival in Utrecht is held every year around mid October for three days. There is live music and usually also a marquee for shelter in case of rain. Usually…but not this year…when it was actually raining! There are many more Dutch bock beer festivals in October of which PINT in Amsterdam is the biggest one. This year it’s held during the last weekend of October. And else, just go to a Dutch pub during autumn or winter and order yourself a nice glass of Bockbier! Cheers! Posted in food & drink and tagged beer, bock, bockbier, Bockbierfestival, Dom tower, Domtoren, Einbecker, La Chouffe, La Trappe, Nederland, Netherlands, Steenbrugge, ufo, Utrecht, Weihenstephaner. Bookmark the permalink.